The housing market has rebounded, even to the point that builders are getting busy again. What they aren’t building as many of these days, though, is condo developments. Builders now are opting for single family homes or rental apartments. Condos were more lucrative, so why is it that fewer are being built? One of the biggest reasons is that after the housing bubble burst, there are new tougher rules on condo mortgages. Couple that with a stronger demand for rentals and lower demand for buying over renting, condos aren’t in demand. It leaves builders in a bind, because condos can be priced more flexibly and are more responsible to market fluctuations than rental units are. In a strong market builders can sell out of condos even raise prices as they sell, faster than it would take to lease all of the units if it was a rental. Condos also help builders pay down their debt faster as they can pay lump sums at each closing. Unfortunately for the builders, the younger, first time home buyers that comprise the majority of home buyers, condos aren’t their biggest choice anymore. As stated above, another big reason for that is the fact that the Federal Housing Administration, which backs mortgages made to low-wealth buyers, made it much harder for people to get mortgages from 2008 to 2012 for condos. Under the new rules, at least half of the units have to be owner occupied and no more than half can be mortgaged with an FHA mortgage in order for the FHA to insure a mortgage for a condo unit. If they are under construction, at least 30% of the units have to be under contract before the FHA will even start issuing mortgages there. That makes it exceedingly difficult for first time buyers to buy a condo. 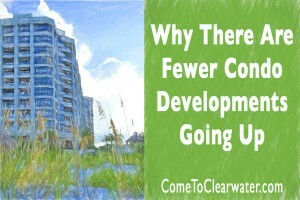 All of those factors have meant that builders aren’t bothering to build condos anymore. Can you blame them?